Yesterday, we wrote a piece on augmented reality headsets from Bridge now being available for pre-order. The options for ordering are with and without the Structure Sensor, the component that’s essential for an augmented reality experience. The Bridge mixed reality headset is essentially for use with iPhone 6 and 6s, and iPhone 7, but now, Occipital is also going after the iPad market with the standalone Structure Sensor. The Structure Sensor is a unique 3D capture device that allows the real-world environment to be merged with virtual components for an augmented reality experience. However, as a standalone product, it is ideal for 3D scanning, real world occlusion, volumetric reconstruction, instant measuring and several other functions. 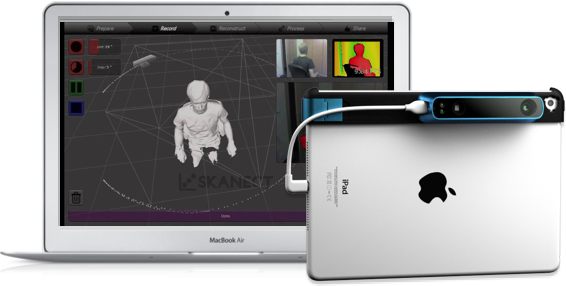 Occipital recommends using the Structure Sensor with Skanect Pro, a popular 3D scanning software for “rapid capture, editing, and sharing of high-quality, full-color, 3D scans.” The software retails for $129, but is included in the bundle pack for Structure Sensor. The device can be purchased at $379 for the sensor alone, or $499 for the bundle, which includes the software. The Structure Sensor can be used with the 9.7-inch iPad Pro, which is the recommended device. It also works with the 12.9-inch iPad Pro, iPad Air and Air 2, and iPad Mini 2, 3 and 4. The product is available in either a blue or a silver finish, and comes with an iPad bracket to attach the device to your tablet. As part of the Bridge experience, the Structure Sensor works to give you an accurate 3D representation of your surroundings. Without it, you’ll be restricted to a pure VR experience rather than AR. By cleverly introducing a standalone option for the sensor, Occipital is tapping into the professional 3D design market and further monetizing its technology. In the face of the fact that Occipital may soon be competing with Apple itself in the AR space, we think it’s a very prudent move to find alternate capabilities that they can cash in on.